E00764. 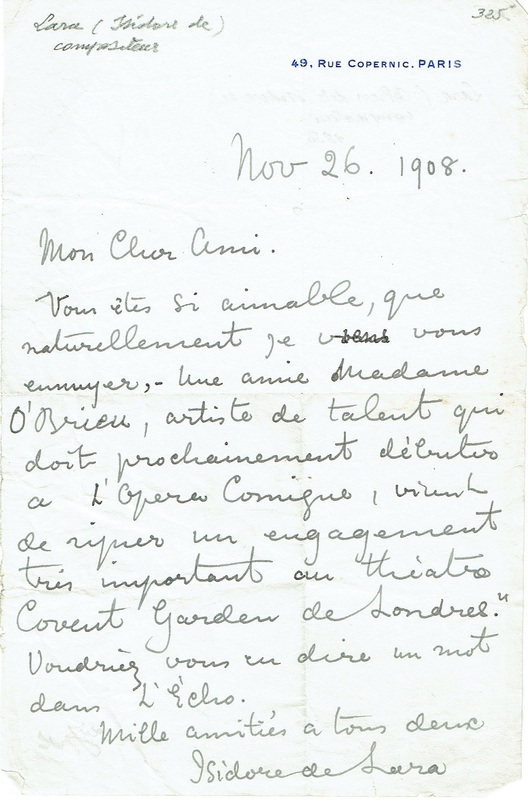 de Lara, Isidor - signed ALS signed, November 26, 1908, 5.5x8.5, references Mme O’Brien’s forthcoming at début at L’Opéra-Comique December 30, 1908. “Isidore de Lara, born Isidore Cohen was an English composer and singer. After studying in Italy and France, he returned to England where he taught for several years at the Guildhall School of Music and Drama and became a well known singer and composer of art songs. In the early 1880s he began to compose music for the stage, eventually achieving his greatest successes with opera in Monte Carlo from the late 1890s through the outbreak of World War I. His most popular opera, MESSALINE (1899), enjoyed frequent revivals throughout Europe and in the United States during the first quarter of the 20th century. He returned to London and spent much of the 1920s trying to create a permanent National opera company in England without much success. Born in London, de Lara went to Milan in 1874 to study composition with Alberto Mazzucato and singing with Francesco Lamperti at the Milan Conservatory. In 1876 he went to Paris to study with Édouard Lalo. The following year he returned to London to take a position as a professor of singing at the Guildhall School of Music and Drama. He became known as a concert singer and a writer of vocal songs. In the early 1880s, de Lara began to switch his attention to composing music for the theatre. His first opera, THE ROYAL WORD, premiered at the Gaiety Theatre, London on 17 April 1883 with de Lara portraying the role of Charles II of England. This was soon followed by WRONG NOTES (1883) and MINNA, OR THE FALL FROM THE CLIFF (1886). A few years later the acclaimed French baritone Victor Maurel persuaded him to turn his cantata THE LIGHT OF ASIA, based on the life of Buddha, into an Italian opera, LA LUCE DELL'ASIA, which was produced at Covent Garden in 1892.